February | 2014 | Living life in the carpool lane..
It’s raining in Southern California. That usually means everyone stops remembering how to drive and accidents abound. I’m a commuter. I commute about 40 miles one way. I’ve always been a commuter. It’s what I do. I don’t mind it most of the time, especially since this current commute travels opposite of the usually rush hour traffic. I really can’t complain. Before motherhood, I didn’t mind commuting in bad weather. I never thought of anything happening to me. It never crossed my mind that I’m just as likely to get into a car accident as the person in the car next to me. Now, commuting in the rain gives me some anxiety. I would hate for something to happen to me while on my commute. The last thing that needs to happen is something bad that would prevent me from parenting M.
Has anyone dealt with this change in perspective when parenthood arrived? I’d love to hear your stories below! M is great at entertaining herself. I guess it comes with the territory of being the only child. The older she gets the better she is at playing with her toys. She makes little scenarios with her little figurines. She plays games with her stuffed animals. She can sit for over an hour doing whatever she can with her Play Doh. It’s really cute watching her play so well. It’s also very helpful that she can entertain herself. It allows Hubby and I to have conversations again. It allows Hubby and I to just sit down and enjoy each other’s company. The other day, Hubby and I were sitting around doing our own things, M was playing in the living room. I was working on a craft project when out of the corner of my eye, I can see M just walking back and forth, dragging varous objects with her. Suddenly, the walking stopped and she got quiet. We all know that a quiet child usually means trouble, so I immediately stopped what I was doing to see what was going on. Much to my surprise, was lying down in a little makeshift bed she created and was watching TV. It was so cute, I had to take a picture..
She took a Hubby’s pillow. 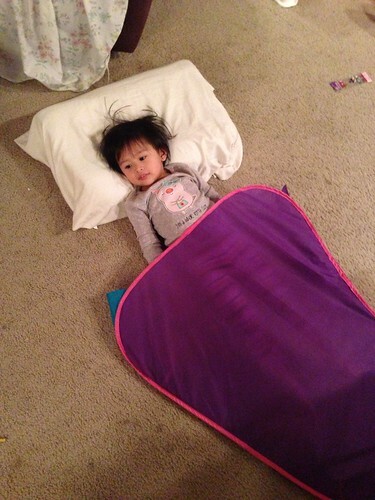 The “blanket” or “sleeping bag” is a Dora the Explorer play tent. She was so content in that bed she made that she stayed there for a good 15 minutes just watching TV. At least we know she can fend for herself in needed.. When we are going out, she will willingly wear the pants. But when we are at home, it’s such an ordeal. We try to put pants on her and she immediately melts down. We take her to her potty and more often than not, she doens’t have to go. She just uses the potty as an excuse NOT to wear the pants. It’s not that these pants are uncomfortable. Her jeans fit fine. She’ll even fight pajama bottoms. Is this a battle that other mothers deal with? Dont’ forget to click the badge on the right sidebar to vote for my little blog. You can “vote” once a day for my little blog. Some of you may have noticed that I have added a badge to the upper right side bar of this blog. Last week, I submitted this blog to Top Mommy Blogs. Yesterday, I got the word that this little blog ‘o mine has been approved! Now, I can wear that badge proudly, but I need help from you! If you love reading this blog, and other mommy blogs, I encourage you to click the badge. Not only will it redirect you to a great source of other fun and informative mommy blogs, it will count as a vote towards my own blog! Votes get reset at the beginning of each month, so you will definitely hear from me about this at least once a month. Help a mommy blogger out by clicking the badge and casting a vote for my little piece of the internet! You know drink too much coffee when..
No. She didn’t get any. There are so many people that I know are expecting to have a baby this year.. Seeing all the pregnant mommies, hearing about pregnant celebrities in the news, seeing pictures of everyone’s newborns..
I’m definitely getting the baby fever and getting pregnant just couldn’t come fast enough.. But why am I in such a rush? I’m putting so much pressure on myself to get pregnant that I think it’s actually preventing me from being so..
With M, it was easy.. we said, “It’s a good time to start, lets try.” Then, BAM! Pregnant! I think the ease of her conception has spoiled me.. if I got pregnant so easily with her, why can’t that happen again? Granted this will only be the second month since we made the decision to finally go for it.. and I know God will bless us with the right little one. There is a list of books that sit by her toddler bed that must be read every night..
Every night it’s, “read the book, go dogs..” then, “read the book, lot of words..” et cetera..
We have read these so many times that most times, she’s reading them to ME! For one, if I skip a page, she knows the books so well, she knows and corrects me..
Secondly, this is her routine. She looks forward to this time. She doesn’t know that I’m too tired. She doesn’t realize that we’ve been reading these same six books for months and months. She doesn’t even care that it’s the same story over and over again. She likes it. It’s mommy and M time. How could I breeze through these books when every time I turn a page, her face lights up as she recites it back to me? How could I feel too tired to read through “Go, Dogs Go” when she and I have special actions we do during parts of the story? It’s like we have our little inside jokes to go along with the story. How can I brush that off like its trivial, when it’s so important to her? So every night, I pull every little ounce of energy I have left, grab the stack of books and just power through it. It’s tough at first, trying to have energy when I feel like I’m running on empty. But by the time I get to the final book, I’m so glad to have that moment with her. What books do you read during bedtime?